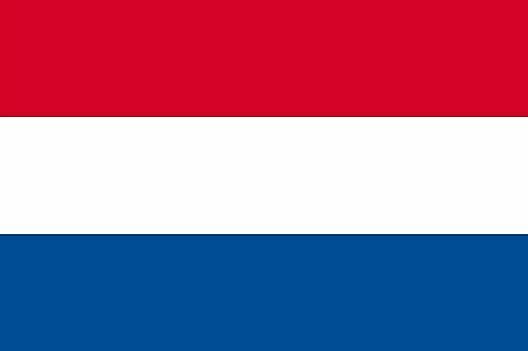 The Netherlands flag was officially adopted on February 19, 1937. At one time this tricolor flag was orange, white and blue, as those were the livery colors of William of Orange, a Dutch prince. In the 17th century, red replaced the orange as a flag color, because the orange dye used on the flag was unstable, and turned red after exposure to the sun. The royal coat of arms is placed on a mantle of ermine surmounted by a crown. 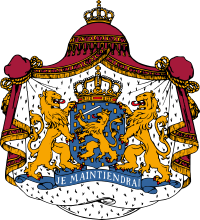 The coat of arms date from 1815, when the Kingdom of the Netherlands was founded. It is the same as the Dutch national coat of arms. It originates from the county of Nassau in Germany, and the central lion is the same as the lion on the oldest coat of arms of Nassau, dating from the 13th century. The Netherlands' official national anthem is Wilhelmus van Nassouwe, or more commonly called Wilhelmus (translation: the William). It is considered to be the oldest national anthem of the world at 440 years old. Popular with the Dutch for centuries, it was not officially recognized as the Netherlands' national anthem until 1932. On most occasions, only the 1st and 6th stanzas (of 15 stanza) are sung. The song was penned during The Netherlands's struggle to gain independance from Spain. It narrates the story of Willem van Oranie, or William of Orange, hislife and his reason as to why he is fighting with the King of Spain. The song is told from the point of view of William, with the anthem's lyrics written in first person. There is some confusion regarding the consideration of Wilhelmus as the oldest national anthem in the world. This is attributed to the fact that Kimigayo, Japan's national anthem, has the oldest lyrics in the world, with the words written during the 9th century but the melody composed in the 19th century. The anthem was created as the official song for the House of Orange and supporters. The lyrics are of unknown origin. The first melodic arrangement for Wilhelmus was created in 1574. In 1626, Adrianus Valerius, a Dutch composer, successfully slowed down the tempo of the melody in order for the anthem to be easily sung in church. The melody used in the current version is an arrangement by Walther Boe from 1932.